As the oldest son of the late Dr. Martin Luther King Jr. and Mrs. Coretta Scott King, Martin Luther King III has seized the torch lit by his parents by continuing their quest for equality and justice for all. Motivating audiences with his message of hope and responsibility for over twenty years, his dedication to ridding the world of social, political, and economic injustice has propelled him to the forefront as one of the world’s most ardent advocates for the poor, the oppressed, and the disillusioned. A graduate of his father’s Alma mater, Morehouse College, Mr. King has devoted his life to working in the non-profit sector to promote civil rights and global human rights and to eradicate the “triple evils” of racism, militarism, and poverty his father identified as the scourges of humankind. As a high school student, he served as a Page to Senator Edward Kennedy. He was later elected as a member of the Fulton County, GA Board of Commissioners, representing over 700,000 residents. The elected president of the Southern Christian Leadership Conference, the organization co-founded by his father, Mr. King is also the founder and president of Realizing the Dream, through which he has spearheaded nonviolence training in Bosnia Herzegovina, India, Israel and Palestine, Kenya, Sri Lanka, and the United States. A former President and CEO of the Atlanta-based King Center, Mr. King remains a member of its Board of Directors. Mr. King has served as an election monitor and observer in South Africa, Nigeria, and Kenya, and has conducted nearly 40 Poverty Study Tours, an undertaking which has sparked public debate and law enforcement advocacy on the issue of poverty. He is also a co-founder of Bounce TV, the first independently owned and operated TV network featuring African-Americans. The network’s content includes movies, sports, documentaries and original programming. He is the recipient of numerous awards and honorary degrees. Are you a difference-maker? In this empowering keynote, Martin Luther King III reveals that the answer to this question can always be, “yes.” Regardless of where we’re from or what we do, King shows we have the power to mobilize, speak out and make a difference. With a career in activism that spans decades, King serves as an ambassador of his parent’s legacy of nonviolent social change and strong leadership in the face of challenge. Whether promoting peace in foreign countries, leading demonstrations against unjust labour practices, or pushing for effective legislation, King has always met deeply-entrenched issues with innovative strategies and inspiring action. Drawing on his wealth of experience as the driving force behind countless institutional, political and social movements, King shares his lessons on how to be a force for positive change, and inspired audiences to make a lasting difference in their own work and lives regardless of their backgrounds and obstacles. In today’s uncertain and divisive political times, issues such as voter rights, gun control, race, police violence, and the security of our cities remain crucial topics of conversation at the forefront of policy leaders’ and citizens’ minds. Drawing on his personal experience as an advocate for justice and social change, Martin Luther King III addresses pressing issues of poverty, violence and injustice, shedding light on a successful and equitable path forward. 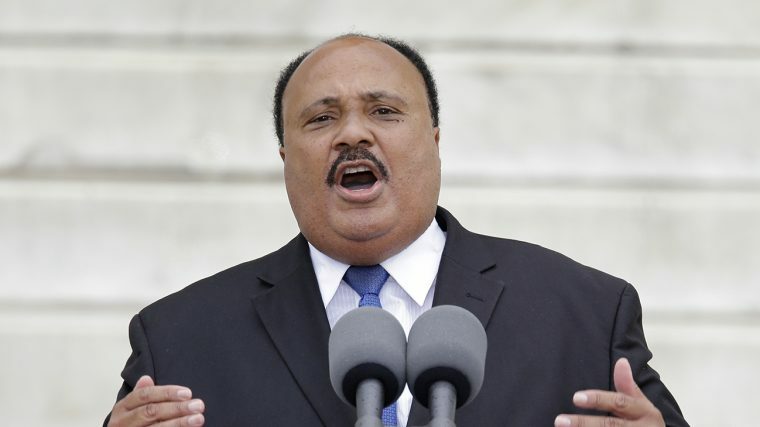 As the son of Martin Luther King, Jr., one of the most iconic civil rights leaders of the 20th century, taking a stand against injustice and advocating for human rights is in Martin Luther King III’s blood. A global humanitarian who has travelled worldwide to make a difference in the lives of all people, King has unique insights into the civil rights battles still being waged today. Reflecting back on the examples and work of his father, King shares Martin Luther King Jr.’s legacy, calling attention to what is left to be done, and the steps needed to make equality for all not just a dream, but a reality. Martin Luther King III has dedicated his life to advocating for policies and practices that promote diversity and inclusion in all facets of work and life. Continuing the legacy of his father, King works to build a world where people of all skin tones and backgrounds have a voice in the conversation and a seat at the table. In this informative and compelling speech, King highlights why creating a diverse and inclusive work environment is not only a moral and ethical imperative, but also brings multi-faceted benefits. From boosting creativity to increased profits, studies show the enormously positive effects of actively building diverse teams and fostering an inclusive workplace in organizations across industries. King brings the research to light and delivers a powerful message on ethical responsibility, motivating audiences to promote diversity and inclusion in their own work environments to create teams that thrive on every level. Martin Luther King III was spectacular! It was such an honour to have him at our event. His speech was heartfelt and impressive, and the audience seemed to hang on to Mr. King’s every word. MLK III was great! We had over 900 in attendance and I have heard only positive feedback from guests. He was great to work with and very accommodating. Great lecture, great speaker. Dr. King did such an amazing job on our stage, and I know the kids in the Chicago crowd were so excited to see him! We’ve received so much phenomenal feedback from the students, teachers and press that attended, and Dr. King was a big part of that!